Now is the fun part. You are the designer! You already have your own unique sense of style, so choose what feels right for you while considering the features of the wedding dress. These are the most often used edges we offer, let us know if you want something different. See a sample of each edge in person! Cut Edge: No edge, this edge is simply left alone once it’s cut. It creates a simple veil. These wedding veils have a disappearing effect and lets wedding gowns show through. Cut edge veils can also be DIY veils, just add your own edge or embellishments. See Cut Edge Veils in action! Pencil Edge: Stitches tightly cover the edge (also known as a rolled hem or satin stitch). Pencil edge veils have a light outline. This is a fine narrow finish that creates simple bridal veils, available in any color. All wedding gowns work well with this simple edge. View some Pencil Edge Veils. Gold Pencil Edge: Metallic gold embroidery thread forms a brilliant pencil edge that goes well with wedding gowns that have gold embellishments. We have found a gold thread that is not too brassy, but you may want to check a sample in person. See photos of Gold Pencil Edge Veils. Silver Pencil Edge: Metallic silver embroidery thread forms a brilliant pencil edge that goes well with wedding gowns that have silver embellishments. The silver pencil edge is a favorite. See brides wearing their Silver Pencil Edge Veils. Lettuce Edge: Also known as scalloped pencil edge, it looks like a wavy ruffled edge like lettuce leaves. These wedding veils have a fluttering effect. A pencil edge is over a mono filament line to create and hold the effect that flutters over wedding gowns. This edge works best on short and medium wedding veils. View some Lettuce Edge Veils. Narrow Ribbon Edge,Polyester Satin: Available in 1/8″ and 1/4″ wide as well as different colors. These wedding veils have a light defined edge with a touch of satin. The ribbon is sewn flat to the front of the veil at the very edge of the veil. (Want organza ribbon? Email for quote) Note: this edge does not work with the oval shape style veils. See the look of Ribbon Edge Veils with Polyester Satin. Silk Ribbon Edge, Silk Satin: Available in 3/8″ or 5/8″ wide as well as 37 colors. This 100% silk ribbon is incredibly soft. These bridal veils have a luxurious flowing edge that frame satin wedding gowns. This wider ribbon is sewn flat to the edge of the veil. Note: this edge does not work with the oval shape style veil. See the beauty of Ribbon Edge Veils with Silk Satin. 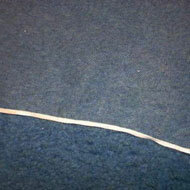 Satin Cord Edge: This satin cord has 1/8″ wide diameter. Wedding veils with this round cord edge have substance and definition that highlights satin wedding gowns. The cord is attached at the very edge of the veil and looks great from front and back. Available in other colors too (email for a quote). View photos of Satin Cord Edge Veils and see the definition the cord adds. Gathered Scalloped Edge: These wedding veils have a cloud effect, as the scallops are formed by gathering up the edge at regular intervals. It works best on bridal illusion or glimmer illusion veils. Swarovski crystal beads or faux pearls are sewn at each inner point to create lightly beaded bridal veils. On long veils it can be done around just the train end of the veil or around the entire edge. See scalloped edge veils in action. True Scalloped Edge: This is a flat curved edge. Beautiful flowing curves elegantly highlight the edge of these bridal veils. They are a nice touch for wedding gowns that have scalloped lace. These wedding veils come with a pencil edge, other edges and trims will not work because the veil is cut out with the curving edge. The true scalloped edge works well with bridal illusion, glimmer illusion and English net veils. Notice the effect on these scalloped edge wedding veils. Beaded Edge: Beaded bridal veils are spectacular! The beading adds weight which helps at windy outdoor weddings or beach weddings. Beads are hand sewn back to back along the edge. Beaded bridal veils can be done with Swarovski crystals, faux pearls, combinations (shown) and other beads. Pearl Trim Edge: 4mm faux pearl trim provides a beautiful accent and a little weight, helpful for outdoor weddings or beach weddings. These pearls come permanently fixed to a cord and machine stitched to the bridal veil. Faux pearls make beautiful inexpensive beaded bridal veils, in white or ivory. Contact us to see more pearl trim veils. Rhinestone Trim Edge: We searched for a rhinestone trim that looks nice on veils and finally found this one. The rhinestones are on a narrow silver ribbon like backing, so from the back it looks like a silver ribbon, 1/4 inch wide with 3mm crystals. On the front the rhinestones are about as wide as the trim and they are spaced close together. Also available with gold backing, or ask for a quote for other colors. Contact us to see more rhinestone trim veils.